Suara Sarawak: How The Baitulmal Chief Raided Sarawak’s Islamic Fund – EXCLUSIVE EXPOSE! How The Baitulmal Chief Raided Sarawak’s Islamic Fund – EXCLUSIVE EXPOSE! The Assistant Minister for Islamic Affairs, Daud Abdul Rahman, presides over all the money collected and distributed by Muslims in the state, through his role as Chairman of the Baitulmal Board (Tabung Baitulmal Sarawak/ TBS). These funds include the obligatory Zakat, raised from the faithful in order to help the poor and needy. However, much of the money is now being diverted into major commercial building projects and we can demonstrate that Daud has extracted millions of ringgit from these charitable funds by passing at least one of these mega-projects through his own companyEastbourne Corporation Bhd. 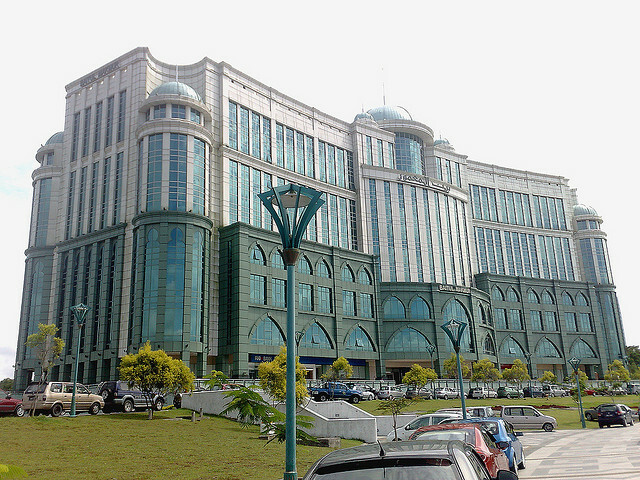 Records indicate that Eastbourne retained RM25million on the deal. This leaves a shocking question. Is the head of Sarawak’s Islamic fund abusing his position of trust to obtain millions raised from the faithful to help the poor? According to our evidence this is indeed the situation and we challenge Daud to explain how it can be possibly appropriate to pass such contracts through his own company? Thanks to ordinances passed by Taib Mahmud, Islamic taxes are now enforced on muslims by the Sarawak State Government by law and amount to considerable sums. However, there has been growing concern over the secretive management of this money by Daud and his so-called Islamic Council. The opposition party DAP has called for the TBS to reveal their finances, but has received no response. 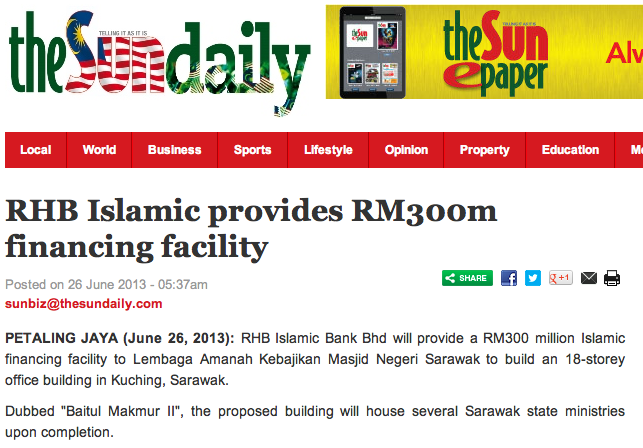 Baitul Makmur building in Kuching is just the start of the building programme financed by Zakat money. There has also been criticism over the recent decisions to spend most of this charitable money on large commercial buildings, rather than helping the needy, many of whom have complained that their support is currently being cut back by the Baitulmal Board. But, such sums pale into insignificance besides the hundreds of millions allocated to a series of grand ‘Islamic Centres’, which have been put up in Kuching, Miri and Sibu. The recently completed Baitulmal building in Kuching cost an announced RM90million and contains a 17 story tower with two floors of commercial space for 74 business lots. Naim Cendera, a company closely identified with the Chief Minister and Chaired by his cousin Hamed Sepawi, was selected by Daud and his Baitulmal Board as the contractor on the project to be officially opened today, Monday 16th September. Other building projects worth RM100 million have also been commissioned by the Baitulmal Board in Sibu and Miri. Compassionate project or mere commerce? However, there is already a new and far grander project underway in Kuching, the so-called Baitul Makmur II building in Petra Jaya, announced in May, shortly after the GE13 election ‘victory’ for BN. Baitul Makmur II is designed as an 18 floor commercial and office building, which it is claimed will house many of the state ministries on its completion. The religious connection is less than clear. However RHB Bank confirmed in June that it will provide a RM300million ‘Islamic finance facility’ to help build this “office building’. At the same time, according to our research, the construction company Hock Seng Lee publicly announced that it had received the contract to build this complex for the sum of RM228million. Yet the contract came not from the Baitulmal Board directly, but from Daud’s own company Eastbourne instead! 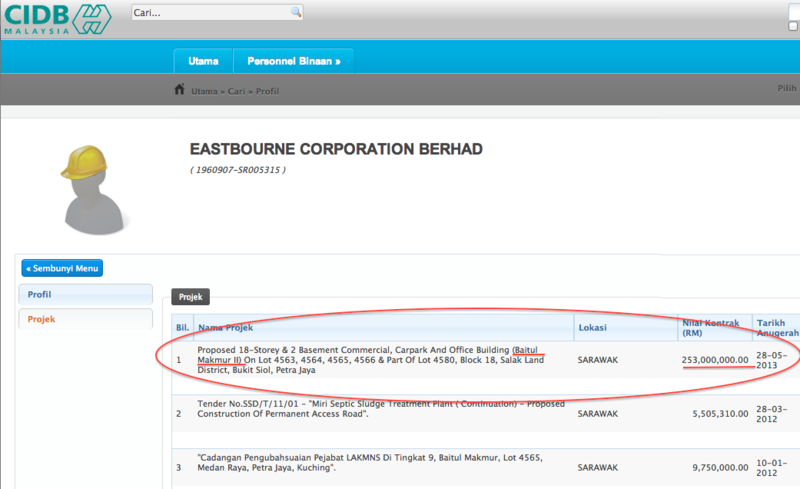 Research in the official Construction Industry Development Board websitemakes clear that the original contract was indeed awarded not to HSL but to Eastbourne Corporation Berhad (below) for RM253million shortly after the election on 25th May. The RHB loan was announced a month later on 28th of June, the same day that HSL also announced that it had entered into an arrangement with Eastbourne to take on the project for RM228 million, RM25million less than the amount originally awarded by the Baitulmal Board. The official Construction Industry Development Board website records that days after the election Daud’s Baitulmal Board awarded his own company the RM253 million mega-project, which a few weeks later was handed on for RM25million less to HSL. Given these public records, we require that the Minister for Islamic Affairs should explain why his Baitulmal Board sought fit to place this mega-construction project originally with his own company Eastbourne Corporation Bhd for RM253million, which swiftly then sub-contracted it to Hock Seng Lee for RM228million? 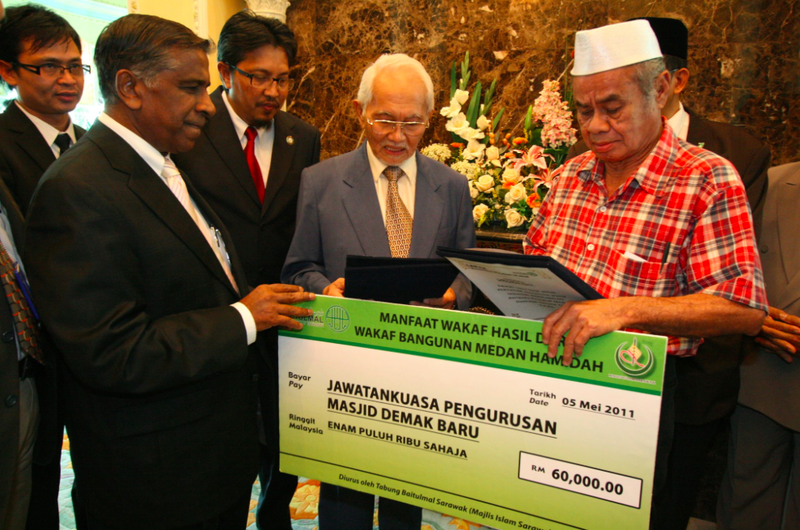 What is the remaining RM25million, which was raised in the name of charity from the faithful, being spent on? It is a matter that Daud’s fellow YBs will be particularly interested in, because they themselves have been recently dragooned by the Chief Minister into ‘volunteering’ a large chunk of their newly increased salaries into the Baitulmal building projects! Civil servants who are muslim are also likely to be directly concerned, because it has been widely mooted that their salaries are also due be docked at source to pay the Zakat, which will then be managed by Daud’s Baitulmal Board. 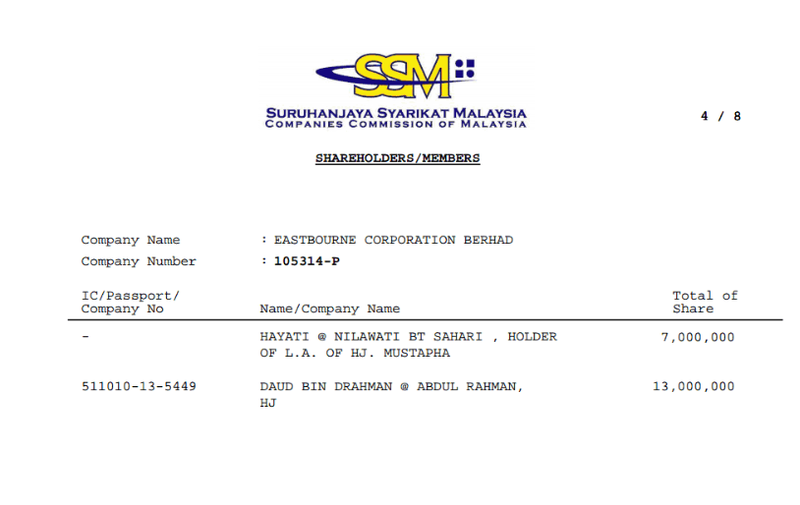 Sarawak Report has already highlighted Daud Abdul Rahman’s company Eastbourne in another context. This Minister for Islamic Affairs’ holds a parallel role as Sarawak’s Minister for Infrastructure Development, in which role he has also presided over numerous public contracts to Eastbourne. With Daud as the key decision maker on infrastructure projects, we have revealed that the State of Sarawak has awarded Eastbourne Coroporation nearly a billion ringgit in public infrastructure contracts. So, it seems a clear pattern has therefore emerged. We see a Minister, who has not hesitated to use his various positions of trust to put vast sums of public money through his own private business. Conflict of interest? – The chief shareholder of Eastbourne, the recipient of the huge Baitulmal contract, is none other than the Chairman of the Baitulmal committee, Daud himself. Many who have questioned whether it is the business of an Islamic charity to be spending the bulk of its money on largely commercial building projects will now have an answer as to one possible motive for these extravagant enterprises. So far, all of the Baitulmal contracts are being pushed through companies in which decision makers have an interest. Another case is a further enormous project being supported by Daud’s Baitulmal Board and the Sarawak Mosque Welfare Trust Board in Batu Lintang. Once again this project benefits his political boss, Taib’s, family company Naim Cendera. The former government quarters are now being turned into a vast shopping centre, 70% of which will be owned by Naim Cendera. The project will comprise a four-storey shopping mall with basement car park, office tower block, hotel tower, a 36-storey office tower with basement and elevated carpark, showroom, 18-storey condominium and a 27-storey high-rise apartment. 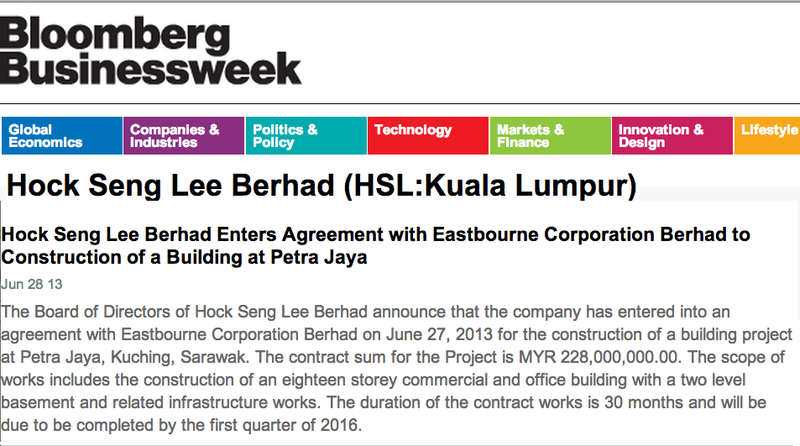 The contractor Hock Seng Lee (HSL) has likewise established itself as a major client company of the Taib family, having received countless sub-contractsfor projects that originally passed through the hands of relatives of the Chief Minister. With the ubiquitous Idris Buang, another of Taib’s key political henchmen, in place as Chairman of the Board of HSL it is not for nothing that the company is spoken of as ‘politically linked‘ – a company to be invested in as it is therefore likely to receive many more projects in the corrupted State of Sarawak.